David would like to know what the inscription is on the white plates below the number on the locomotive and below 'L M S' on the tender. Note the engine in the background has a similar plate on its tender. The subject engine is Prince of Wales no. 5677, Precedent, and I believe the shed may be Crewe South. Although it is not possible to see clearly, the 'white plates' are almost certainly not plates at all but the word CONDEMNED stencilled on in white paint or even possibly whitewash. Many pictures taken in Crewe Works yard show this kind of thing quite clearly and in the case of no. 5677 the word is in the same sort of position on the cabside and in the middle of the tender side. The condition of the engine supports this suggestion. Has the nameplate been removed or daubed over with some sort of black 'gunge'? Baxter shows no. 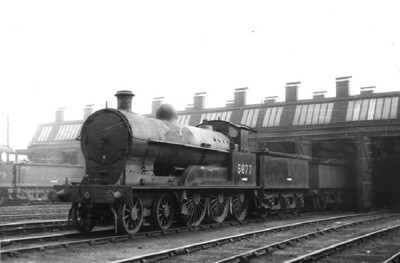 5677, originally LNWR no. 1749 Precedent, built in November 1915, as withdrawn in January 1935. The engine in the left background is possibly no. 25629, originally LNWR no. 637 Thomas Gray, withdrawn in December 1934, but in view of the fragment of another number is perhaps more likely to be no. 25679, originally LNWR no. 2063 Hibernia, built in May 1915, withdrawn in May 1935. More to the point, where is the shed? I agree, it looks like Crewe South, though for a shed that was usually so busy, it seems strangely deserted. This seems to be Crewe North Stock Shed. See photo in LMS Engine Sheds by Hawkins & Reeve, p107. I attach two pictures relevant to this mystery. Details are below. The first one is another photo of no. 5677 and on it the words 'CONDEMNED' are legible. This photo was taken by Leslie Hanson, his reference number 717, and he has written on the back 'Crewe North 14.4.35', which I think puts the details beyond question. The other picture has 'Copyright R. K. Blencowe collection' on the back and is captioned 'Crewe, 13.4.35' - the day previous to Leslie Hanson's picture. There cannot be much doubt that no. 5929, originally LNW no. 2395, J. A. F. ASPINALL, is in fact in Crewe Works yard and is awaiting breaking up. The word 'CONDEMNED' can be clearly seen. The engine shed in this photo looks to be Sutton Oak. It could be that Crewe and the Sutton Oak shed were built to the same style but I think a careful distinction needs to be made before either is accepted as the right place. I certainly agree we should be careful when identifying locations of photographs; there are far too many wrong captions in print already. But in this case the details of the northlight windows (damaged panes etc) are just like those on the photo which is definitely of Crewe North Stock Shed in the Hawkins & Reeve book, so it seems certain that's where it was taken.